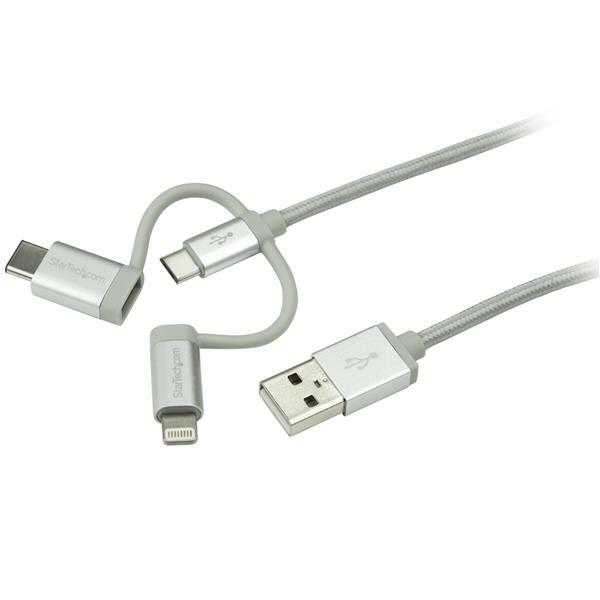 This is the best cable to have with you at all times. I use the Micro USB to charge my portable battery, and the lightning connector to use the battery to charge my iPhone. Beats carrying two cables! Love the design too. I received this product in exchange for an unbiased review. This is great especially to keep in the car. It's a 3 in one charger that will charge or synch the majority of devices out there. 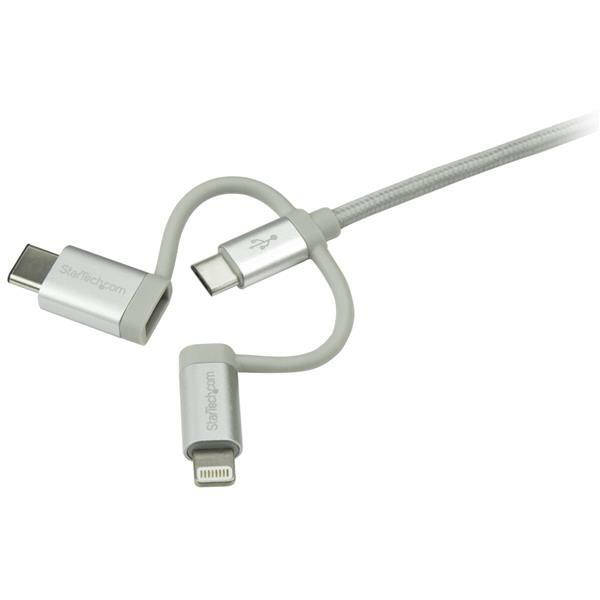 It's has the lightning connector for newer Apple devices, USB Micro-B connector for most android devices and the USB-C connector for newer devices. This cable looks and feels very solid and durable. 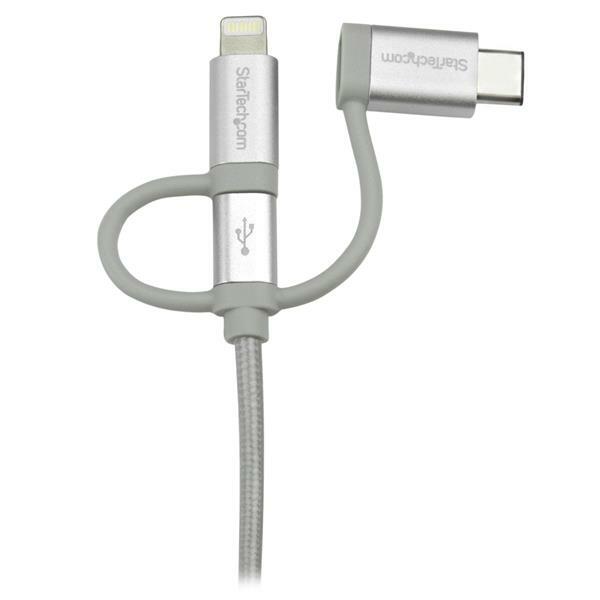 It has very solid connectors and the cable is thicker than most and braided that looks like it will take anything you can throw at it. Great solid product. I received this product in exchange for an unbiased review. I bought two of these recently but was disappointed when the apple connector on one did not work it was apparent that the blade was not properly seated I will return it for a replacement. I have used this multi-end cable on as many devices as I can find and I haven't had an issue with any. The cable comes in a box just slightly bigger than DVD case (different than other cables that come in a zip-lock bag). 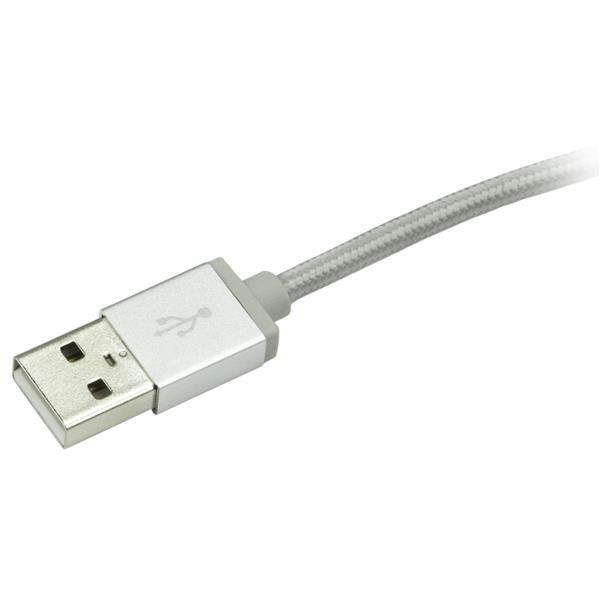 The cable is covered in a fabric and is more rigid than other USB cables. The fabric weave on the cable gives it a nice 'premium' feel. 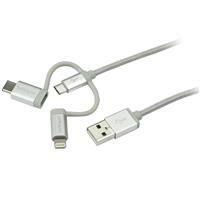 Multiple tips are held onto the main cable with a flexible rubber. I am nervous about the longevity of the rubber, but so far I have not had any issues. The different ends all clip together very securely and with a snap. 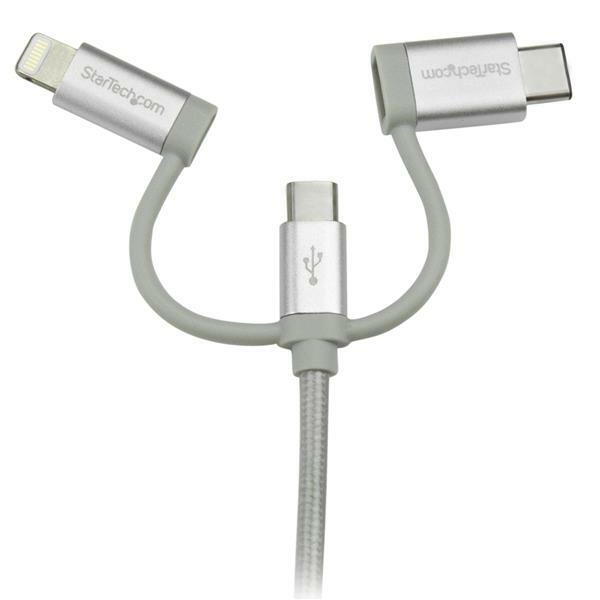 The cable itself has a micro-USB end with the two tips for lightning (iPhone) and USB-C (newer devices). I like that I can leave just this one cable in my car for passengers and I don't have to worry about what type of device they have. I received this product in exchange for an unbiased review. (4 stars) One cable to rule them all. Used to carry multiple cables, and now I can carry one! Received one for review, and loved it so much, I bought another for the car. Braided outer covering is more robust than the usual rubber that gets beat up so easily. The two attached adapters are mounted in such a way that one can easily attach either one in the dark if needed, without worrying about which way it's facing! The adapters stay in place readily as well. The only drawback I can see is that with an adapter on the end, the overall connector is kind of long and am afraid of snapping it. Hasn't happened yet though! I received this product in exchange for an unbiased review. I got this for my kids to use for their many different devices. The thick gauge cable has withstood my kids yanking on the cable to unplug their devices. Great quality and functionality. This cable performed flawlessly. 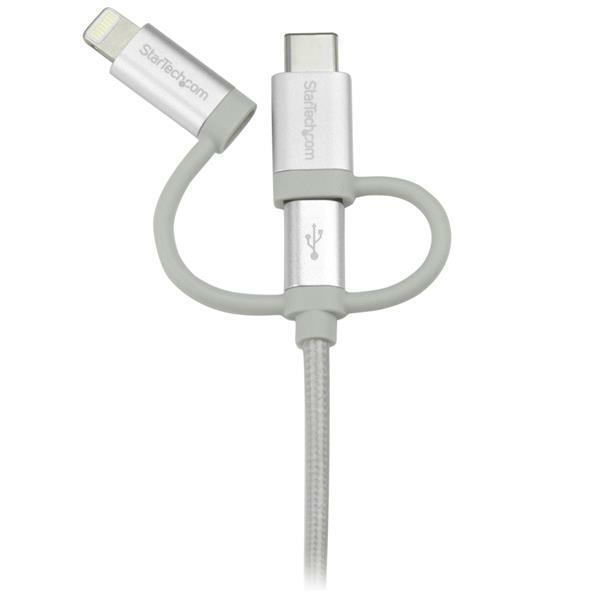 The braided cable added strength and durability which was great because the flexibility and convenience of the micro usb, usb c and lightning connectors made this cable the one stop shop for charging of all of our frequently used devices. The connectors were all of high quality and fit perfectly in each type of device. A fantastic product. I received this product in exchange for an unbiased review. (5 stars) A must for travelling on the run! This 3 in 1 charger is a must! Lightning - USB-C - Micro-B - what else do you need? If I have guests in the car I am covered if they need to charge their mobile device. The cord is braided for durability and is far superior to the other charging cords I have used in the past. I received this product in exchange for an unbiased review. Found this very convenient for several devices I use. Not just for while travelling but in the work area as well. Eliminates having to have 2-3 cables to connect the devices while only using 1 usb port. Disclaimer - I received this product in exchange for an unbiased review.